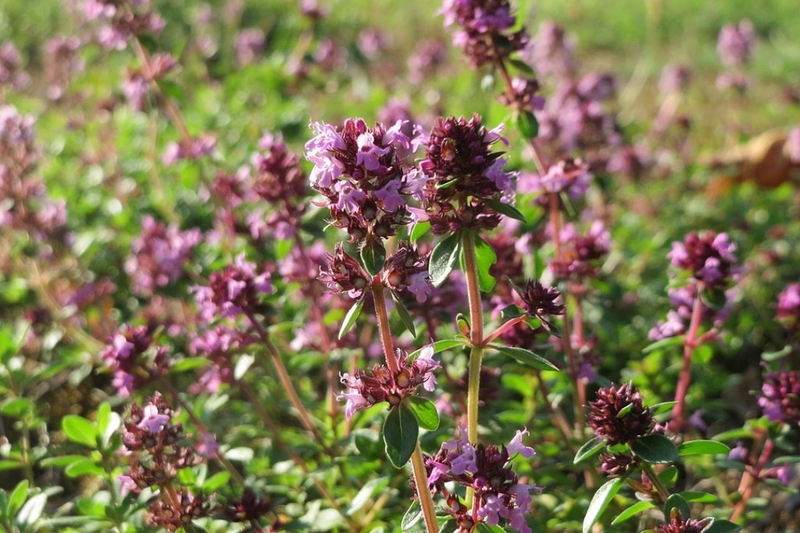 Broad-leaved Thyme (Thymus pulegioides): growing, planting, caring. A creeping thyme with a mild aroma, ideal for cooking. Broad-leaved Thyme is an European plant from very sunny dry lands, up to 2000 m altitude. It likes poor soils, neutral or calcareous, well drained. It forms a tuft of spread stems that cover the ground. These stems are redish and hairy, and bear small oval leaves grouped in opposite pairs. Flowering lasts from July to August, it is pink, grouped in ears of flowers with two lips. The lower lip has 3 lobes. Mulch lightly with slowly decomposing wood chips or a chalky mineral mulch, once a year in November.